Monsoon is almost here and with rainy days comes the fear of cough and cold. If you are suffering from cough and cold, and wondering how to get rid of it using natural remedies then here’s the post worth reading. Today in this post, we are going to learn about several natural home remedies for cough and cold. You can use these remedies to get rid of cough and cold much effectively and without any fear of side effects. There is nothing new about seasonal cough and cold. However, what triggered me to particularly write this post is that, of late I am seeing people around me falling ill on a frequent basis. I tried figuring it out how ancient people managed to fall less sick and remain hearty and strong in comparison to today’s generation. In ancient time, life was much simpler on the contrary, to the busy routined life that today’s generation lead. People today get minimal time to actually take care of their health making them more prone to illness, especially seasonal health issues like cough and cold. Not always deadly diseases, but a cold or cough or flu is a common thing that we notice in every family. We all know that “Prevention is better than cure”. With this intention, I will be sharing with you 31 simple home remedies for cough and cold that works like magic. Besides, hectic lifestyle, the sudden weather changes also affects our health largely. Sudden change in temperature, such as going from cold environment to a very hot environment or vice versa, will weaken your resistance, simply because your body tries to re-balance itself more quickly than usual. In other words, a changing weather can stress out your immune system, making you more vulnerable to infections and viruses. This is why I often see people easily get ill during a seasonal change. Moreover, now monsoon is round the corner bringing with it, its own set of weather – induced disturbances. The damp, humid weather is the perfect time for various germs like bacteria, fungus to breed causing lot of health issues and infections. Nevertheless, as usual, the most common illness is a cold or a cough. What is cold and cough? Common cold, also known simply as a cold, is a viral infectious disease concerning the upper respiratory tract that primarily affects the nose. In addition, it may also affect the throat, sinuses, and voice box. Signs and symptoms may begin less than two days following exposure. There are around more than 200 different types of viruses that are known to cause the common cold, with “rhinovirus” causing approximately 10%-40% of all adult colds. Coronavirus, adenovirus, parainfluenza virus and respiratory syncytial virus are the other commonly implicated viruses. Because so many different viruses can cause the common cold, and because new cold viruses constantly develop, our body fails to develop any resistance against all of them. For this reason, colds are a frequent and recurring problem. It is commonly observed that school kids can have 6 to 12 colds per year while adolescents and adults typically have 2 to 4 colds per year. The common cold occurs most frequently during the fall, winter, rainy reason and spring. In order to cure the problem, you first have to know the exact symptoms. Common cold symptoms appear about one to three days after the body becomes infected with a cold virus. The short period before symptoms appear is called the “incubation” period. Symptoms are frequently gone in 7 to 10 days, although they can last for around 2 weeks as well, depending on the severity of the problem. This is one of the very first symptoms that occurs in cold and cough. In such a situation, our throat feels dry, itchy, and scratchy, makes swallowing painful, and can even make eating solid food difficult. The reason behind a sore throat might be the inflamed tissues brought on by a cold virus. Besides, postnasal drip or even something as simple as prolonged exposure to a hot, dry environment can lead to sore throat. A runny nose or nasal congestion (stuffy nose) are two of the most common symptoms of a cold. These symptoms occur usually when the blood vessels and mucous membranes within the nose swell due to the excess fluid. The nasal discharge tends to become thicker and yellow or green in color within three days. However, the Centers for Disease Control and Prevention (CDC) consider these types of nasal discharge to be normal. Someone with a cold also may have postnasal drip, where mucus travels from the nose down to the throat. Sneezing is triggered when the mucous membranes of the nose and throat are irritated. Our body releases its own natural inflammatory mediators, such as histamine when a cold virus infects our nasal cells. When released, the blood vessels dilate and leak due to the inflammatory mediators, and the mucus glands secrete fluid. This leads to the irritation that causes sneezing. You can develop a cold along with a dry cough or with the one that brings up mucus, known as a wet or productive cough. Coughs tend to be the last cold-related symptom to go away and they can last from one to three weeks. The major problem that occurs due to prolonged coughing is that ultimately your chest and stomach starts to ache. Contact your doctor if coughing lasts several days. Moreover, few are some of the conditions where medical help is a must. In some cases, a cold virus can cause slight all-over body aches, or headache. These symptoms are more common with the flu. However, call your doctor if they last more than 10 days, you begin to have yellow/green nasal discharge, or a severe headache or sinus pain, as you may have developed a sinus infection (called sinusitis). This is very common when you start to sneeze and cough a lot, you automatically water your eyes. This is a proof that your health condition might worsen in the following days. A mild fever might accompany your cold. Nevertheless, if the fever is around 100.4 degree Fahrenheit, it is advisable to take medical help. Fatigue comes along with cold. These are days when you feel extremely tired or dizzy. You just want to lie down. There is complete lack of energy. Due to prolonged coughing and sneezing, you might also develop earache. Sometimes it can be mild while it can get severe. We all know how much it hurts. Isn’t it? When you feel sick and tired, automatically you do not feel like eating anything. You tend to have a puckish feeling if your force yourself to eat. This generally weakens your body even more. The common cold can spread in two ways – one by direct contact with infected secretions from contaminated surfaces and the other by inhaling the airborne virus after individuals sneeze or cough. When an individual who has a cold blows or touches their nose and then touches someone or something else, it leads to person-to-person transmission. A healthy individual who then makes direct contact with these secretions can automatically be infected, often after their contaminated hands make contact with their own eyes, nose, or mouth. Often when a cold virus lives on objects such as pens, books, telephones, computer keyboards, and coffee cups for several hours, it makes the individual who is exposed to these objects more vulnerable. Now that you have known the various symptoms and the ways that it can get transmitted, let me give you few very simple remedies which you can use to get rid of it or even prevent it from occurring at all. 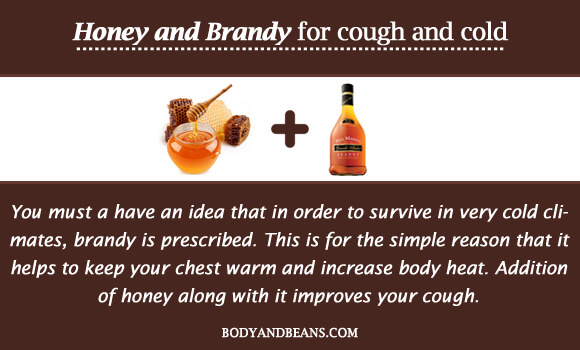 Honey: Recent studies show that honey is better than cough medicines. Besides adults, honey is even safe for children age 1 and older, and kids are happy to take it because it tastes good. Try using dark honeys, such as buckwheat, because they are higher in antioxidants resulting to better relief. You can mix honey with other ingredients like ginger for best results. Ginger tea: Ginger tea is extremely beneficial as it dries up a running and dripping nose and expels phlegm from the respiratory tract. In addition, ginger helps soothe cold, make it bearable and perhaps even speed up the recovery process. Drinking warm ginger tea also helps reducing the sore throat. 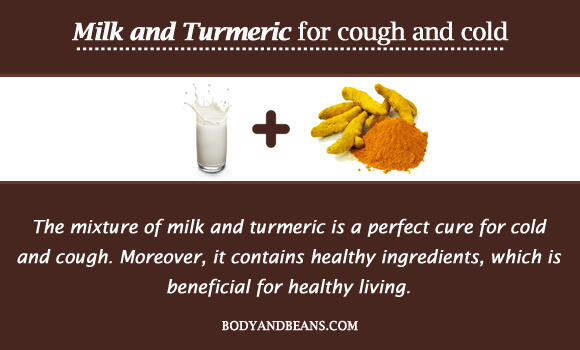 Mixture of milk and turmeric: The mixture of milk and turmeric is a perfect cure for cold and cough. Moreover, it contains healthy ingredients, which is beneficial for healthy living. Mixture of lemon, cinnamon and honey: Take a pan and then half fill it with honey and use a double boiler until it is thin. Add a pinch of cinnamon and then lemon in it. This syrup is just perfect to fight a cold. Mixture of honey and brandy: You must a have an idea that in order to survive in very cold climates, brandy is prescribed. This is for the simple reason that it helps to keep your chest warm and increase body heat. 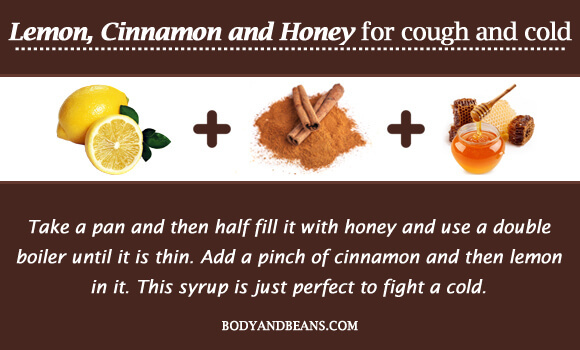 Addition of honey along with it improves your cough. Amla: Amla or the Indian Gooseberry is a strong immunomodulator and prevents our body from the onset of many diseases if taken regularly. It ensures the proper functioning of the liver and improves blood circulation and can be used as the best remedy for cough and cold. 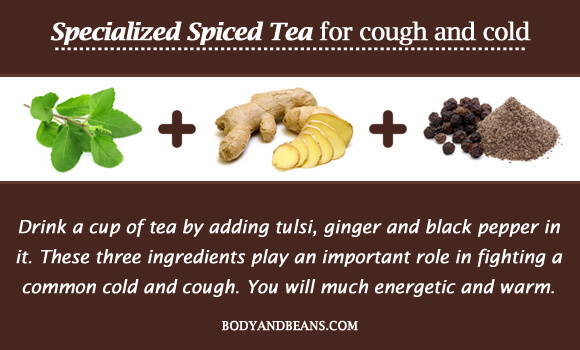 Specialized Spiced Tea: Drink a cup of tea by adding tulsi, ginger and black pepper in it. 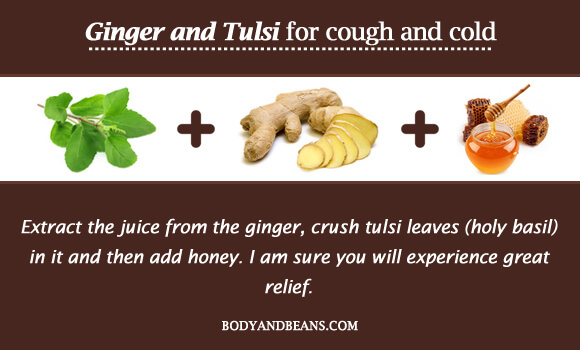 These three ingredients play an important role in fighting a common cold and cough. You will much energetic and warm. Mixture of honey, lime juice and warm water: Lime water is great for digestion and improves our circulatory system. Addition of honey and warm water can work heavenly for cold and cough. And this is it’s one of my favorite remedies for cough and cold. Flaxseeds: Boil flaxseeds till the time it thickens and then strain it. 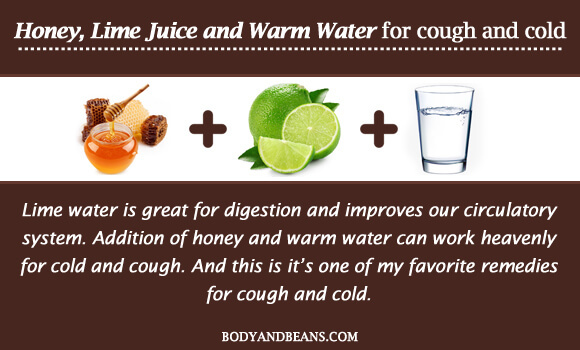 You can add few drops of limejuice and honey to get results that are more effective. Mixture of ginger and salt: Cut ginger into Julians. 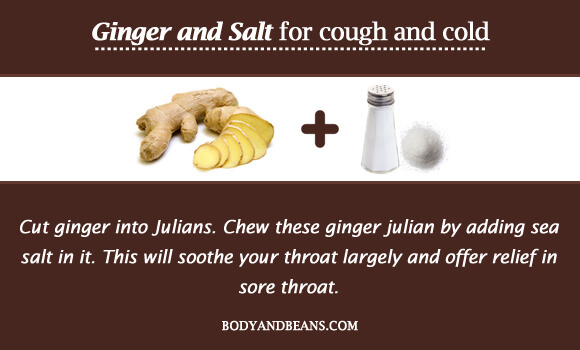 Chew these ginger julian by adding sea salt in it. This will soothe your throat largely and offer relief in sore throat. Ginger and Tulsi mixture: Extract the juice from the ginger, crush tulsi leaves (holy basil) in it and then add honey. I am sure you will experience great relief. Garlic: You can actually sauté few garlic cloves in ghee and eat it when warm. You may find it quiet weird but this actually works. Honey and Onion Syrup: Having a nasty cough? I will give the perfect solution. 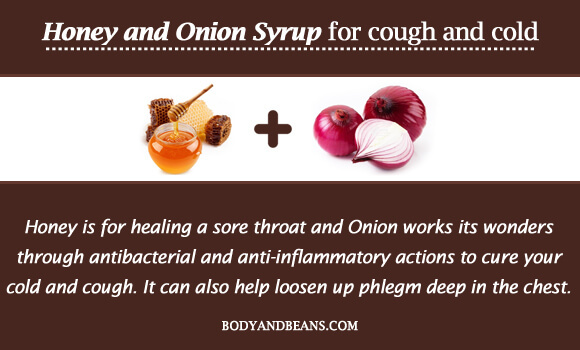 Until now, you already know how important honey is for healing a sore throat but do you know that onion works its wonders through antibacterial and anti-inflammatory actions to cure your cold and cough? It can also help loosen up phlegm deep in the chest. Jaggery: Are you suffering from chest congestion? Just boil water with black pepper and then cumin and jaggery. This procedure will give you huge relief. Mixture of marshmallow root, licorice root, cinnamon and ginger: Ok so this syrup is not the sweetest of examples, but it is effective! 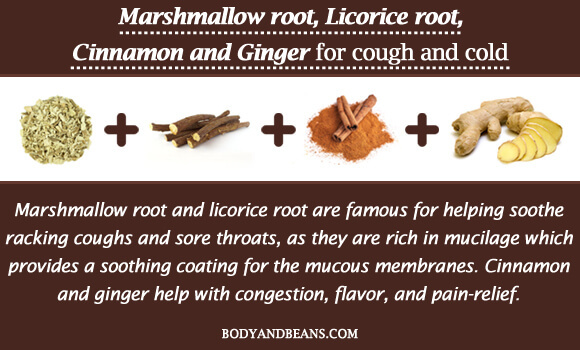 Let me just tell you that Marshmallow root and licorice root are famous for helping soothe racking coughs and sore throats, as they are rich in mucilage which provides a soothing coating for the mucous membranes. Cinnamon and ginger help with congestion, flavor, and pain-relief. Carrot Juice: This remedy is quiet uncommon and unconventional. Nevertheless, trust me, carrot juice really works and is a good remedy to cure seasonal cold. Radish: This delightfully crisp, spicy vegetable is both anti-septic and full of vitamins and minerals. While horseradish is the more powerful decongestant, regular garden radish works just as well for some people-especially those who are sensitive to spice. Chicken soup: Research shows that chicken soup has anti-inflammatory properties, which can help you, reduce your cold and cough. Moreover, it is yummy and tasty, so I am sure you and your kids will love it. A great taste accompanied by great relief. Mullein: You must be wondering what is this? Well, let me make things clear to you. It is a biennial (grows every other year) plant, which you can easily find alongside roads in temperate climates, or zones 5-9 in the United States. It is tall, with small yellow flowers and leaves that start out soft and downy. Mullein being an excellent expectorant thins out and loosens up phlegm so you can cough it out. It work wonders in case of chest congestion. For best results, you can combine it with other expectorants like thyme. Gargle Therapy: This is probably one of the easiest and ancient therapies used during cold and cough. Salt-water gargle by adding a bit of turmeric is till date rated one of the most effective remedies. Even I will suggest you this. Essential Steam: One beautiful almost instant fix for a stuffy nose is to steam it out. This is a favorite remedy of mine and worth repeating in numerous remedy lists. You can glean the benefits of steam by breathing it in from a mug of hot tea, taking a hot shower, or filling a bowl with a hot water and adding an essential oil. The best essential oils to use for this are the strong ones like tea tree, peppermint, or eucalyptus (tea tree and eucalyptus being the best in my opinion.) The anti-bacterial/anti-viral properties of tea tree oil can be carried via the steam, which will help fight off any bug that you’re battling. Both tea tree and eucalyptus are, of course, rather strong smelling, which also helps dislodge congestion. Here’s a detailed post on how and which essential oil can be used to treat cough and cold easily. Loosen up with heat: A good old-fashioned hot water bottle can help loosen phlegm and deep congestion in the chest. The gentle steady warmth will loosen up your muscles, and soften up the phlegm to help it come up. It is a very simple, non-invasive home remedy indeed. If you like, rub a little of the above salve on your chest to increase effectiveness. Acupressure: Acupressure is a wonderful way to relieve discomfort for a number of ailments, and colds are no exceptions. By triggering the right pressure points, you can open up the blocked sinus cavities and open up your nasal passages, relieving pressure and releasing blocked congestion. Sinus clearing bath salt: Take 1 cup of Epsom salt and in a different dish, blend 3 drops of eucalyptus oil, 3 drops of peppermint oil and 3 drops of lavender oil. Add the oils to the salt and stir thoroughly with a spoon. While taking a bath, fill the tub half way, then add 2-3 teaspoon of salt and then fill the rest of the way. This aromatherapy combined with the relaxing warmth of the bath just can’t be beaten. Proper hydration: Your body loses more water while fighting a fever, so make sure you drink plenty of water and fluids to keep your body hydrated. A mixture of water and salt often helps replenish fluids and electrolytes. Drinking lukewarm water also helps reduce the inflammation of the throat. Proper sleep: Your body needs proper rest after so much of hectic work. Adults however can cope up with it. Nevertheless, little kids, they need adequate rest to stay fit. If your child is lethargic every time, his/her immune system may be too sluggish to fight off bad bugs. Unfortunately, maximum kids fail to get as much sleep as they should. Ideally, babies’ need up to 18 hours a day, toddlers and preschoolers need 12 to 14 hours and grade-schoolers should get 10 to 11 hours. It is probably not practical for your child to wake up later, so if he/she is not hitting these numbers, make his/her bedtime earlier. Wash hand frequently: Washing hands properly and frequently is a must for everyone. Studies show around 80 percent of infectious diseases, including the common cold, spread through touch. Do not forget to carry alcohol-based hand wipes, sanitizers when you are out, or traveling somewhere, as the possibility of water being present everywhere is very uncertain. Keep your home clean: Needless to say the more you keep your rooms clean, the lesser will be the possibility of germs. Use phenyl while cleaning your floors. This will make your rooms aromatic as well. Viruses can live for up to two hours on things like cups, countertops, and towels, so disinfect frequently touched areas and objects with bleach or antibacterial wipes. Use paper cups in the bathroom, separate toothbrushes to keep them from touching, and avoid sharing glasses, plates, or utensils. Moisten the air: You can keep a cool-mist humidifier in the rooms to help ease stuffiness. Try to avoid warm-mist humidifiers and vaporizers. Change the water daily as bacteria and mold breed fast. Thoroughly clean the unit, following the manufacturer’s instructions. A steamy bathroom or a warm shower might help as well. Sponge bath: If you are having a fever, a five-minute sponge bath in lukewarm water can actually make you cooler and can lower your temperature. You can repeat it for your kids as well. Seasonal cough and cold can seriously affect your health and day to day life. 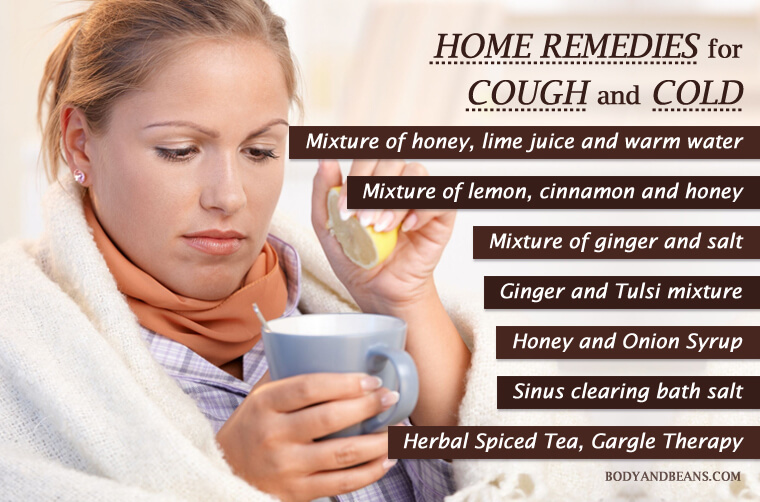 Taking pills and cough syrups is okay, but why not try time tested remedies to get rid of common cough and cold. We have discussed about some of the best natural home remedies for cough and cold, which works like magic. I personally prefer such remedies over the pills and syrups, especially to cure seasonal cough and cold. Just pick the ones, which you think is most suitable for you, and try those out. Do not let the nasty cough get the best of you. 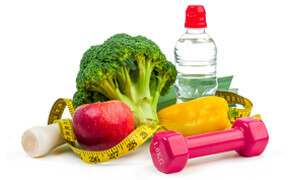 Lastly eat healthy, drink healthy, stay happy, and yes do not forget to share me your feedbacks. Magnificent site. Plenty of helpful information here. I am sending it to some friends ans also sharing in delicious. And of course, thank you on your effort!